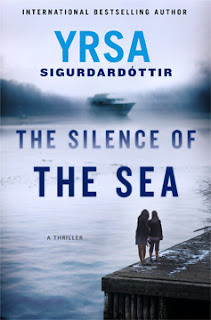 Thóra is hired by the parents of a man presumed lost at sea. When a yacht is repossessed by a financial institution, its representative, Ægir*, takes advantage of the inability of one of the crew members to make the sailing from Lisbon, Portugal, to Reykjavík, Iceland, and signs on for the missing crew member. Because he was using the occasion to also take a family vacation, he has his wife Lára and two of his three daughters with him. Even though Ægir has no particular expertise in sailing a yacht, the captain and two bona fide crew members seem to be all that is really needed. The yacht shows up in Reykjavík, but there is no one aboard. The three crew members and Ægir and his family have disappeared. The communications and emergency equipment have been disabled. Then the dead bodies start appearing. Karítas, the wife of the man who lost the yacht to debt, haunts the book with a heavy presence in absentia. She was famous for being famous. Many of her expensive clothes and personal belongings are still aboard the boat. Thóra has been asked to help obtain the life insurance benefits for his parents to help with raising the youngest daughter, who was left at home with them. So Thóra somehow has to provide substantive proof that, absent bodies, Ægir and Lára are dead. In alternating stories, we follow both Thóra’s investigation and the events on board the boat during its final days. Spooky things are afoot in both stories, and there are shivers as Thóra and others are at a loss to explain sights and occurrences. Are all on board dead? What does Karítas have to do with any of it? Yrsa gives the chills along with the requisite thrills. And what I like about Yrsa is that her stories also contain humor (especially vis-à-vis the not-so-bella Bella). She provides the counterpoint to her fellow Icelander Arnaldur Indriðasson’s dour mysteries. *Ægir’s last name is never given. In Iceland, last names are patrynomics or matrynomics. Giving last names is generally not as important as in other Western cultures. His last name is probably Margeirsson, based on his father’s name. “The Language of Secrets” is the follow-up to “The Unquiet Dead,” a moving portrayal of the atrocities visited on Muslims in Srebrenica. Inspector Esa Khattak returns as the tenuous head of the Toronto Community Policing Section. His assistant, Rachel Getty, is still as feisty and dedicated, dedicated to being the courageous and humane police officer her father was not, and dedicated to being a loyal and committed member of the CPS. Although Khattak is on an occupational tightrope because of the circumstances of “The Unquiet Dead,” he is called in to work on the murder of an old friend in the cold winter woods of a Canadian park. What muddles the icy waters is a purported link to terrorist activities in his friend’s mosque. Surprisingly, his friend turns out to have been an undercover agent trying to prevent an attack. So who killed him? Rachel is the one who goes undercover in the same mosque, pretending to be interested in converting. Khattak, as a high-profile detective, is too well-known to the attendees to be a mole. His personal life becomes entangled in the case early on when it is revealed that his willful, beautiful sister is romantically involved with the suspected leader of the terrorist cell. 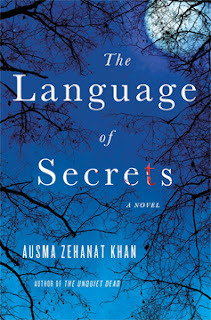 As with the first book, the strength of the second book lies in its depiction of the Muslim world struggling for identity in a non-Muslim country. As Ausma Zahanat Khan says in her afterword, “There is no inherent connection between Islam and terrorism, despite the rash of events that appear to link the two. Like all religions, Islam is multi-vocal, and there are different interpretations of Islam available to its practitioners….” This is certainly worth remembering in light of recent real terrorist activities done in the name of Allah. For people not knowledgeable about Islam, Khan serves as an educator. “The Officer’s Prey” is a fine novel about war and, incidentally, one about crime. Although we follow the investigation of Captain Quentin Margont of Napoleon’s army in 1812* as he attempts to catch a vicious serial killer, it is really one person’s view of the deadly march to Moscow by Napoleon’s forces to make tsarist Russia part of his empire. War inevitably begets death and that is accepted by all. In Margont’s view war is necessary to institute the egalitarian republic that France has fought for and modeled. But what an atrocity when someone deliberately adds to the death toll, and not for any lofty ideal. A woman has been killed by her “Prince Charming,” as she described him, in a Polish town overrun by Napoleon’s forces on their way to Moscow. Prince Eugène, the general in charge of Margont’s division, suspects the murderer is someone of note who has killed before, and he wants to keep the investigation on the down low. Without giving much background on why Margont was chosen (prior military investigations? civilian experience? ), he begins his investigation by determining it was one of four colonels. This is a pretty clever, albeit contrived, deduction to narrow the field from four hundred thousand men to four. Through slog and travail, gunfire and cannonshot, snobbery and idealism, French author Armand Cabasson depicts his investigator’s tenacity against long odds. Beating Death to the punch would be a worthy punchline. I was captivated by this vivid portrayal of war and death. 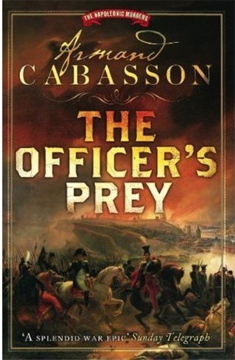 Although a true rendering of the horrors of this death march would have contained more grotesqueries, Cabasson includes enough horrors to put the strongest Napoleanic republican ideals to the test. Cabasson wrote three novels with Margont as his hero. 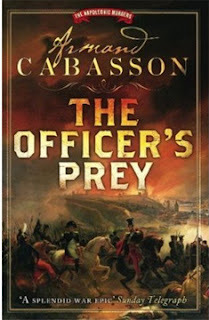 Cabasson is a psychiatrist, and “The Officer’s Prey” reflects this background. Examination of the psychological underpinnings of his characters adds a lot to the story. As an aside, Cabasson gave a real medical ancestor of the time, Jean-Quenin Brémond, a fictional role in his books. *I’m ashamed to say that for a time I heard “It’s the cereal that’s shot from guns” (the ad slogan from the 50s-60s for Quaker Puffed Rice set to the 1812 Overture) running through my head. 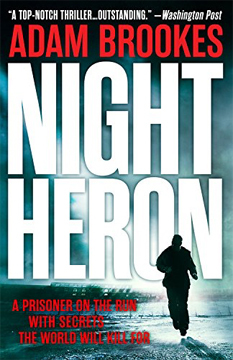 “Night Heron” is a provocative, cynical novel about a British journalist in China being drawn involuntarily into the world of espionage. Adam Brookes is himself a journalist with Asian credentials on his resumé. For people used to James Bond/Mission Impossible action, most of the action here takes place in the last hundred pages of the book. There are chases, subterfuge, and violence in the first three hundred pages, but they are of the quieter variety. One can almost see the tension peak like a lop-sided roof during the book. Everything seems to be going fine, then wham, we're off to the races! Philip Mangan is journalist for a small British news service. His colleagues, Harvey and Ting, are also friends. They are good at investigating substantive Chinese issues, like underground rebellions, and proud of what they do. Then Peanut comes into Mangan’s life. The first part of the book deals with Peanut’s escape from a “re-education” facility. After twenty years away, Beijing is another world to him. Of course, Peanut is not his real name. Before he was sent away, he was an unworldly, intelligent, optimistic volunteer agent for British intelligence. Using his old contacts, he tries to put himself back in that picture as a way of getting out of China. Unfortunately, his old spy contact, a man working undercover as a journalist, is long gone. Mangan is the closest Peanut can get. But it’s not close enough because Mangan has no idea in hell what to do. “Night Heron” is a sideways look at how global economics and cyberpolitics shape the world. The bad guys wear black hats, but maybe there aren’t any white hats because there aren’t any good guys. It’s fifty shades of a grey moral wasteland. I would have been disappointed if the book had been given to tidy resolutions, but it certainly isn’t for readers looking for James Bond-style romanticizing. The spy plot aside, Brookes writes about China with open eyes and affection. It’s a good combination of life through the eyes of a foreigner and a thoughtful world view. 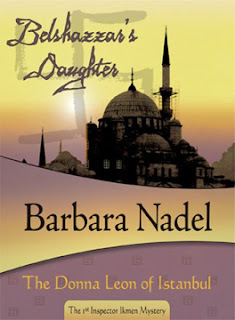 Inspector Çetin Ikmen of the Istanbul, Turkey, police force is the grand creation of British author Barbara Nadel. There are now eighteen books in the series, but “Belshazzar’s Daughter” is the first. Ikmen has a tolerant if irritating family. His wife is pregnant with their ninth child; his father, who lives with the family, is nosy. He has an intolerant superior at work and a young, dandified, aristocratic underling, Suleyman. Although Ikmen’s physical appearance is gnomish and unprepossessing, he is known for getting the job done. The job this time is the murder of an old Jew in the Jewish region of Balat in Istanbul. Leonid Meyer has been burned by acid and mutilated. Why kill him? He was all but bedridden, an alcoholic, and on death’s doorstep anyway. Who could have hated him that much? In the process of finding potential witnesses, the police stumble across British ex-pat Robert Cornelius, a teacher at a nearby language school. Author Nadel follows two storylines: Ikmen’s and Cornelius’. From Cornelius’ perspective, we see a man running from initially unspecified demons. He mindlessly performs his job. He is in an obsessive relationship with a young Turkish woman, Natalia. And he was walking in the wrong place at the wrong time. Natalia has a strange, strange family. Her mother is shy, her grandmother is enigmatic and creepy, and the male members of the household are emasculated, disfigured, or mentally damaged. Natalia herself has odd proclivities, and she is not above using the men who fall at her feet, especially weak-willed Robert. Ikmen and Suleyman discover that Natalia’s grandmother, Maria, knew the murder victim. But it is like extracting a particularly embedded wisdom tooth to discern what their relationship was. Between Robert’s recalcitrance and Maria’s inscrutability, Ikmen has a, pardon the expression, Byzantine path to follow to solve the murder. Although Nadel does not live in Istanbul, she writes with an intimacy of its shadowy corridors that seems authentic. Her characters have interesting quirks and flaws and vulnerabilities. These characters are endearing, repulsive, enigmatic, and provocative. She writes with a modern sensibility but also with a venerative bow to Istanbul’s ancient history. A well-done introduction to a distinguished series. To my shame I have read only one book ("Life or Death" by Michael Robotham) in the Best Novel, New Novel, Best Paperback categories. I guess there's now a big list of books ahead of me. So far I've gotten zero percent right in the years since I've tried to read all the Best Novel nominees and guess the winner. Perhaps I shouldn’t have read the second book, “Finders Keepers,” in the Det. Bill Hodges (Ret.) series first. Although “Mr. Mercedes” won an Edgar and was critically well-received, I liked “Finders Keepers” much better because of the storyline. “Mr. 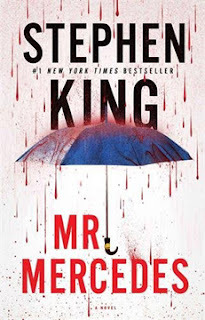 Mercedes” proceeds along a predictable general plan, although with the Stephen King pizzaz to elevate it. Bored in retirement after a meaningful police career, Bill Hodges is watching daytime “reality” television and contemplating suicide. He had three big cases hanging fire when he retired, one of which really fried his gullet. About a year ago, someone had crashed a Mercedes into a crowd of people, killing several, including a mother and her baby. The perp then sped away and left nary a clue behind. While nursing his ennui, Hodges receives a letter from someone claiming to be Mr. Mercedes, the driver of the killer car. By taunting Hodges and playing on his guilt at not having caught the driver, Brady Hartsfield gleefully hopes Hodges will commit suicide. (Yes, we immediately learn the identity of “Mr. Mercedes.”) He has been secretly observing the overweight, aimless ex-detective and wants to play. At first Hodges does not believe that Mr. Mercedes has really written to him. He delves a little more into the case, interviewing the sister, Janey Patterson, and mother of recently deceased Olivia Trelawney. It was Olivia’s Mercedes that Brady used to mow down the people. When Janey shows him a letter Olivia received similar to the one he has, Hodges realizes that Olivia was probably driven to suicide by Mr. Mercedes. Now his dander is up. Enlisting the help of a teenage neighbor, Jerome, Hodges and Janey try to find Mr. Mercedes. Hmmm. It was pretty shaky ground that King used to explain why Hodges didn’t go to the police for help. Surely an ex-cop would be even more likely to turn the “evidence” over. Nevertheless, this contrivance makes for some excellent high adventure by the trio. Of course, King’s characters reign supreme. He does a wonderful job of gifting his characters with quirkiness. There are loops and turns, the road running rough for both good and evil. It’s not necessary to read “Mr. Mercedes” before reading “Finders Keepers,” but there are some nice backstory setups in “Mr. Mercedes.” After reading “Mr. Mercedes,” do not stop, do not pass go, head straight to “Finders Keepers.” The third book in the proposed Bill Hodges trilogy should be out soon. Was it really Frank Zappa who first uttered, “So many books, so little time”? In the vast space of the Internet, I cannot find a decent attribution. But my deep down belief is that this thought has been around ever since the invention of papyrus scrolls and rice paper. Sorry. I’ve strayed off the mystery path once again, because there are so many good books that have recently popped to the surface. In an era when the publishing industry has to reinvent itself and authors have to reinvent writing and the public has to reinvent how it reads, there is still such excellence out there that I will never be able to read everything I want to read, even if I were to live to 130. 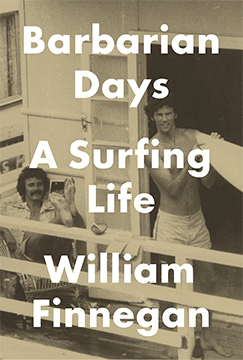 I’m returning to the world of mystery after this, but what an excellent way to leave the non-mystery world than with this memoir by New Yorker staff writer William Finnegan. What first drew me to this book is that I grew up in Hawaii and surfing was everywhere. Surfing talk, surfing clothes, surfing hair, surfing movies, and, oh yes, even the actual wave surfing on the magnetic beaches of Hawaii. It didn’t matter that my swimming style was only a little better than dog paddling. It didn’t matter that I did not surf. Like my friends, I wore reverse aloha print clothing, listened to The Beach Boys, watched the Makaha surfing championships on television, and knew the names of the best island surfers. Some of my classmates surfed. They surfed the uneven, far-off, shark-infested break off my island that ended in coral and riptides. My way was by far the safer surf obsession. But as I know, especially after reading William Finnegan’s book, it was not the more interesting. Finnegan was blessed to have grown up in Southern California and Hawaii. (His Hawaii stories are sad — he was a haole, after all — and funny and touching.) He learned his craft early and had enough talent to surf some of the best waves in CA and HI, before taking off to surf the world. Even those of you for whom the thought of surfing curls your lip and beetles your brow might enjoy Finnegan’s engaging writing and storytelling. It is a special writer who can be self-deprecating about his own triumphs, yet give us a sense of how nature goes where it wants and surfers are, truly, just along for the ride. This is not a mystery, except in the sense that science fiction books are about the mysteries of the universe. However, it has a strong sense of adventure and daring. Also, maybe you like trilogies. For me, unless an author closes off some of the major storylines in each book, I find it hard to wait for the new installments. That said, “The Fifth Season” is the first volume in N. K. Jemisin’s projected new series, and I liked it a lot. She does a good job of answering some major questions in this book but, of course, also leaving open some big questions for later on. Young Damaya is taken from her home by a “Guardian.” She is enrolled in a school for children with a strange talent: the ability to draw power from the earth. This is very valuable because in Damaya’s time, the earth (presumably our Earth in the way, way future) is volatile. There are volcanic eruptions, earthquakes, steam vents, and all sorts of potentially catastrophic natural occurrences. People like Damaya have the ability to mitigate these events. One would think that this would be a laudable quality, but in the outside world her kind (the “orogene”) are feared and abhorred. Although she in the “Fulcrum” to learn to control her power, it appears that the organization offering her sanctuary may not be benign. There are two other storylines running alongside Damaya’s. Syen, a young, Fulcrum-trained woman has been assigned to be the consort and trainee of a ten-ring (the highest level) orogene. It’s a position of servitude and submission, a situation that rankles Syen. Essun has the third storyline. She is a young mother whose husband has murdered their young son and kidnapped their daughter. She, too, is an orogene but living a normal life in a village, without the villagers knowing her true identity. Her journey is to get her daughter back. Unfortunately, the world seems to want to tear itself apart in a major way just as her search begins. 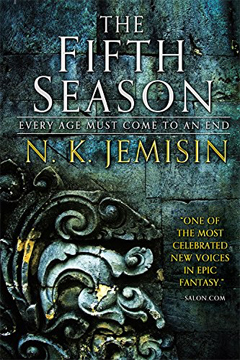 Jemisin has created a world trembling on the verge of extinguishing human life. She makes it thrilling. Her female characters are strong, vulnerable, and learning to deal with their faults as they attempt to save those whom they love. If you are inclined towards science-fiction and have never read N. K. Jemisin before, here is a worthy beginning.